This bibliography lists the references used in The Complete Guide to Choosing Wildlife & Nature Venues. 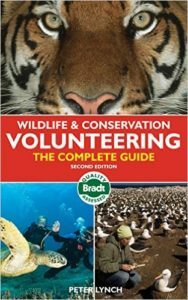 [LP12] Wildlife & Conservation Volunteering: The Complete Guide (Bradt Travel Guide) by Peter Lynch. 2nd Edition June 19, 2012. — Peter Lynch investigates volunteer organizations and rates them according to a range of verifiable criteria, including their scientific usefulness. Their credibility is assessed in terms of: accolades and endorsements, organization, financial records, evidence of environmental benefit and scientific outcomes. This updated guide includes long- and short-term opportunities from roughing it in tents, through simple permanent accommodation to quasi-luxury. First-hand accounts by volunteers provide insight into the day-to-day life of being a volunteer. [AF11] Green Volunteers: The World Guide to Voluntary Work in Nature Conservation (with access to online database) by Fabio Ausenda (2011). — This guide highlights hundreds of volunteer projects throughout the world. Green Volunteers lists more than two hundred projects worldwide for those who want to experience active conservation work as a volunteer. Projects are in a variety of habitats and countries, lasting from one week to one year or more. Projects involve volunteer work in wildlife rehabilitation centers, national parks, and protected areas, and general conservation work with a variety of animal species. The guide has three indexes set up by geographical area, animal species, and project cost, all to help prospective volunteers choose their favorite conservation project. Almost all the projects are open to anyone without previous conservation experience, and most projects do not have language requirements. The Green Volunteers guide is a onetime purchase. Anyone who purchases the guide can receive free updates via the internet, plus an extended annotated list of useful websites that allow the reader to find hundreds of additional projects. 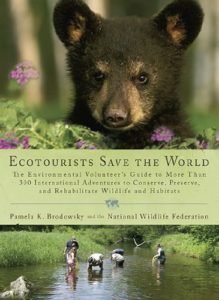 [BP10] Ecotourists Save the World: The Environmental Volunteer’s Guide to More Than 300 International Adventures to Conserve, Preserve, and Rehabilitate Wildlife and Habitats by Pamela K. Brodowsky, National Wildlife Federation. April 6, 2010. 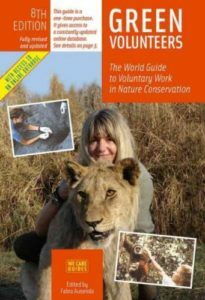 — This guide profiles more than 300 programs where volunteers can work in a variety of activities involving conservation and study of wildlife. ★ Using these guides do not exempt the reader to verify if the listed projects are ethical and responsible. Here is a non exhaustive list of references to help you learn how to identify welfare issues, questionable or plainly unethical practices, to give you further questions to ask to volunteer organizations and wildlife tourist venues… These references are a subset of the more complete body of work that we refer to on our site. [WAZA] The World Association of Zoos and Aquarium. WAZA is the unifying organisation for the world zoo and aquarium community. [BFVG] Born Free Foundation Voluntary Work Guide. [GFAS] Legitimate Sanctuaries vs. Pseudo-Sanctuaries — By the Global Federation of Animal Sanctuaries. [WASP] World Animal Sanctuary Protection — A young nonprofit we stumbled upon and that provides great tips for identifying ethical sanctuaries. [SS15] Saving Serabie: The Fight Against Lion Hunting— Winner documentary of the 2015 Wildlife Conservation Film festival: A documentary film about the fate of farmed lions for the sole purpose of feeding the hunting industry. [BL15] Blood Lions — Blood Lions follows environmental journalist and safari operator Ian Michler, and Rick Swazey, an American hunter, on their journey to uncover the realities about the multi-million dollar predator breeding and canned lion hunting industries in South Africa. [GS16] Tiger Temple Accused of Supplying Black Market. Guynup, S. in National Geographic (2016) — The Tiger Temple in a Thailand monastery was a wildlife park praised by tourists who refused for years to acknowledge the warnings. Finally early 2016, the proof made it to the public, and it is now established that monks at the monastery have been speed breeding the big cats for the illegal trade of tiger parts. Note well that it is just one of a number of tiger temples in Thailand who have yet to face the consequences of their cruelty. The Tiger Temple was the most famous one. [MA15] I Volunteered At An Orphanage, And Now I Campaign Against It. McKeon, A. from the Better Care Network (2016) — An interesting read about our impact as volunteers. And a lot of what is being said in this cautionary tale also applies to animal rescue and wildlife conservation volunteering. [CB16(a)] Volunteering with Captive Wild Animals? O’Neill, C. (EwA publication 2016) — Volunteering in a wildlife rescue can be a good experience as long as it does not harm voluntarily or involuntarily the species. Quick tips about how to recognize them, and what to do to prepare. ✧ Volunteer Etiquette —which highlights critical skills to take with you on our mission and adventure. ✧ Wildness Etiquette’s Annotated References section —for learning more about wildlife ethics.